1In spite of a decline in bilateral trade in recent years, Nigeria still remains the European Union’s most important market and supplier in sub-Saharan Africa after South Africa. Conversely, Europe Fifteen is Nigeria’s first trading partner, both for imports and exports. An important fact in sub-Saharan Africa is that despite the decline of European investments in non-energy sectors, Nigeria is peculiar in that it is a country where the amount of investments exceeds the amount of European public assistance to development. Only South Africa shares this status with Nigeria. If the country’s position as crude oil supplier to the union and the magnitude of its overall debt (37 billion dollars) to mainly European creditors are added to, these aspects, a strong interdependence becomes observable. This immediately places the European Union (EU) in a privileged position to establish political and economic dialogue with the Nigerian authorities. At the same time, the magnitude of European interests atstake in the country makes the EU necessarily circumspect in its relations with Nigeria, an approach which often elicits criticism. 2One of the initial indications from the foreign trade statistics of the European Union is Nigeria’s position within the ACP group as the EU’s first trading partner. According to data from the European Communities’ Statistical Office, (Eurostat 1994), Nigeria took the lead as the primary supplier to the EU with a total of 3.9 billion ECU and as the Union’s primary market with a total of 2.1 billion ECU, representing at the time 21 per cent of all European imports from the zone and 14 per cent of all exports from the EU towards the then ACP 69-country group. In sub-Saharan Africa, only South Africa exceeds Nigeria in importation as well as exportation. In Africa in 1994, Nigeria was the fourth supplier after South Africa, Libya and Algeria, but ahead of Morocco, Tunisia and Egypt and the sixth market after South Africa, Algeria, Egypt, Tunisia and Morocco but ahead of Libya. Compared to the Union’s global trade, however, trade with Nigeria only represented 0.71 per cent of imports and 0.38 per cent of exports in the same year. 3Conversely, towards the end of the 1980s, transactions with member states of the European Union represented about half of Nigeria’s foreign trade. In fact, the volume of trade has fallen drastically in recent years. Consequently, exports from Europe 15 to Nigeria declined from 4 to 2.7 billion dollars between 1992 and 1994, while Nigerian imports decreased from 5.7 to 5.2 billion dollars. Nevertheless, during the period under study, Nigeria’s trade surplus rose from 1.5 to 2.5 billion dollars. In 1995, data from Eurostat showed no major change in this surplus situation: Nigeria once again recorded a trade surplus of 1.2 billion ECU for 3.3 billion exports and 1.9 billion imports. These figures, however, decreased respectively from 15.4 per cent and 9.6 per cent compared to 1994. 4In 1995, according to Eurostat, Nigerian export of crude oil and petroleum products to Europe exceeded 88 per cent of all her exports. Other exports included agricultural products and live animals (4.5 %), manufactured goods (2.8 %) and non-consumable unrefined materials (2.5 %). Next came machinery and transport materials (1.2 %), animal and vegetable oils (0.39 %), and chemicals (0.3 %). 5In 1994, Nigeria’s major clients were, in descending order of importance: France (1.234 million dollars), Spain (1,070 million), Italy (380 million), United Kingdom (196 million), Austria (164 million), Sweden (132 million) and Belgium (88 million). According to the same source, Greek imports were 2 million dollars, and Denmark’s one million. No data was provided for Finland, Ireland and Luxembourg, which suggests that the first two countries did not import Nigeria’s products and in the third, that imports by Luxembourg were probably subsumed in those of Belgium, in the data supplied by the Belgium-Luxembourg Economic Union. 6Not surprisingly, the order of Nigeria’s major European clients corresponds more or less with that of its major crude oil buyers. In 1994, Spain which purchased 8.2 million tons was ahead of France (7.6 million tons), Germany (6.9 million tons), Netherlands (5 million tons), Italy (798 000 tons), Belgium (580 000 tons), United Kingdom (308 000 tons) and Greece (122 000 tons). Altogether, in 1994, Europe 15 with 34.8 million tons was the second of Nigeria’s oil clients, following the United States of America (36.6 million). This is a situational change. In 1992, 46.9 per cent of Nigeria’s oil exports went to Europe as the first client ahead of the United States (39 %). In fact, in 1994, Europe remained a strategic client for Nigeria, having purchased more than 35 per cent of its oil production. If the slightly higher American imports were to be added to this percentage, obviously, the United States and the European Union have considerable negotiating power. 1 Lettre Afrique Energies, no. 286 of November 15, 1995. 2 Africa Confidential, vol. 35, no, 4. 7It should also be noted, that though the American market is the primary market for Nigerian oil, European companies play a more important role than American companies in the production of Nigerian crude oil. Consequently, Shell, which like its competitors has a joint venture arrangement with the Nigerian National Petroleum Corporation (NNPC), provides half of the crude oil production, which slightly exceeded 1.8 million barrels/day at the end of 1994. In addition, Agip, in collaboration with Philip Petroleum and NNPC, produces 130,000 barrels, i.e., 7.2 per cent of the total national production, while Elf Aquitaine produces 95,000 barrels, i.e., 5.2 per cent of the total. Apart from these companies, another European actor, albeit a non-commu-ity member, plays an important role in the marketing of Nigerian crude oil: the Swiss-based company, Glencore of March Rich, who became notorious in the 1970s and 1980, by disregarding the United Nations embargo on oil supplies to South Africa. According to numerous professional sources, Glencore is an outlet for most of Shell’s production, which only sells 270,000 barrels/day1 directly. It is also an outlet for some of Mobil’s output of a minimum of 225,000 barrels/day. According to a survey by Africa Confidential,2 Glencore would have thus struck a 90,000 barrel/day deal for a German company, Wintershall in 1994. Some Lebanese intermediaries, this time the Chagouri family, long-time close associates of General Sani Abacha, according to the London newsletter, played an important role in negotiating oil-lifting contracts for the French multinational, Total. It is to be noted that the Spanish company, Repsol, is also one of the end-users of Nigerian oil. 8In fact, numerous grey areas persist in this trade. Consequently, an official Nigerian newspaper in 1994 denounced the fact that more than 7 per cent of total national production, i.e., about 150,000 barrels/day, were fraudulently sold. This led the military government to institute a tax corresponding to 0.15 per cent of the cargo value. This infuriated major oil companies, including Shell, Agip and Elf who requested the Minister of Finance to suspend the decision. 9It can be observed that Nigeria, which is one of the major world producers of cocoa, though far behind Côte d’Ivoire and Ghana, produced about 145,000 tons during the last season, a major portion of which was exported to Europe 15. In the end, however, prospects for the development of this trade are gloomy due to the decision taken in the first quarter of 1996 by the European Commission to revise the 73/241 directive on chocolate. Indeed, the revised directive, which still requires the approval of the European Parliament and member states, envisages allowing the Union the use of 5 per cent of non-vegetable fats, besides the cocoa butter for the entire union. According to projections by the European Union’s Chocolate, Biscuit, Biscotte and Preserves Industries Association (Caobico), such a change in the regulation could lead to a fall in world consumption. The International Cocoa Association evaluates the probable loss at 135,000 tons, i.e., about the equivalent of Nigeria’s production. Such a fall, which represents about 4 to 5 per cent of world supply, according to Professor Kees Burger of the Amsterdam Free University, could lead to about a 30 per cent downward reduction in price. 10Finally, in 1995, classification of Nigeria’s major clients (all products inclusive) did not change significantly. According to Eurostat, Spain ranked first on the list of Nigeria’s European clients with a total of 830 million ECUs, ahead of France (655 million), Germany (522 million), Portugal (354 million), Netherlands (318 million), Italy (202 million), United Kingdom (195 million), Austria (156 million), Sweden (51 million), as well as Belgium and Luxembourg (44 million), Greece (3.1 million) and Ireland (1.6 million). Figures recorded for Denmark and Finland were below a million. 11Importation of European products reflects a more diversified structure: in 1995, machinery and transport equipment ranked first (39.5 %) ahead of manufactured goods (17.3 %), chemicals (16.5 %), food products and live animals (6.4 %), and animal and vegetable oils (5.8 %). 12In 1994, the United Kingdom ranked first among Nigeria’s European suppliers with 719 million dollars ahead of France (518 million), Germany (494 million), Italy (393 million), Netherlands (328 million), Belgium (124 million), Spain (81 million), Austria (39 million), Sweden (28 million), Denmark (22 million), Finland (21 million) and Greece (5 million). 13The following year, according to Eurostat figures, the United Kingdom was still the first supplier with 460 million ECUs ahead of Germany (415 million), France (372 million), Netherlands (215 million), Italy (166 million), Belgium (88 million), Denmark (18 million), Finland (6 million) and Greece (4 million). On the whole, the Union’s member states are not only Nigeria’s first clients, but also her primary suppliers. However, this predominance is waning. The European share of the Nigerian market actually declined from 64 per cent in 1988 to 51.5 per cent in 1992, whereas the share of Asian countries (excluding Japan) and Latin-American countries (China, Brazil, Hong-Kong, India, South Korea) rose considerably from 9 per cent to about 12 per cent, whilst that of Japan fell from 9.1 per cent to 6.4 per cent. 14Now, these very general data hardly provide indications on some sensitive aspects of bilateral trade. Thus, until very recently, Nigeria has also been a considerable outlet for the military industry of some member states. Between 1991 and 1994, 80 MBT-MK-3-type British-made Vickers tanks, part of a 150 unit total order representing a 282 million dollar contract were supplied. The World Development Movement (WDM), a London-based peace organization, in 1994 claimed that the British export insurance-credit organization, the Export Credit Guarantee Department (ECGD), gave coverage to the sale of weapons to Nigeria, despite the accusations of human rights’ violations levied against the country at the time. In addition, from the WDM documents, deductions can be made that the weapons’ supply contract included a clause allowing the Nigerian client to pay the bill in kind. In other words, in crude oil. In fact, WDM revealed the existence of such barter dealings between the British military industry and Saudi Arabia. The operation was said to have been financed from royalties owed the Saudi Arabian government by Shell and British Petroleum companies. 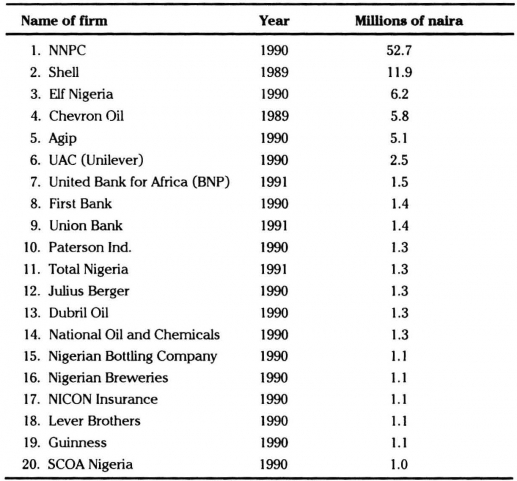 From the above, therefore, the suspicion that Shell was involved in the recent purchase of weapons by the Nigerian military government, appears legitimate, especially since the company officially admitted to having purchased, ‘more than 15 years ago’ (sic) weapons to equip the Nigerian police force after the publication of an article in the Observer in 1996. Shell, however, later formally denied actually ‘importing’ weapons into Nigeria. 15All the same, if WDM is to be believed, supplies of British Vickers continued even though, after the annulment of the June 1993 elections by the military junta and the December 1993 military coup d’Etat, the union’s member states and the United States announced that, requests for export licences for weapons to Nigeria would be examined on a case by case basis with a ‘presumption of denial’. Moreover, after the Minister responsible for the exportation of British weapons, David Davis, had assured WDM that, since that time, no licence had been issued for the exportation of deadly weapons to Nigeria, the London government, however, admitted in January 1995 that thirty export licences had been issued for the sale of ‘non lethal’ weapons to Nigeria since January 1, 1994. According to research undertaken by WDM, the criteria for distinguishing between lethal and non lethal equipment are unreliable. In 1994, for example, about twenty licences involved objects classified under various headings, including small calibre weapons, machine guns, bombs, torpedoes, missiles, vehicles, toxic and anti-riot chemicals, explosives, combat vessels, aircraft and training equipment. Moreover, in June 1995, the Foreign Office itself acknowledged that licences for the supply of rubber bullets to the Nigerian police were issued. 16However, the United Kingdom is not the only country within the EU with the monopoly to sell weapons to Nigeria. According to the Flight International magazine of 19 October 1994, the Italian company, Partenavia, was negotiating a contract for the supply of about thirty reconnaissance aircraft. The Austrian company Steyr-Daimler Puch, was alleged to have ‘recently’ (sic) sold not less than 300 armoured personnel carriers to Nigeria. In 1993, France also was alleged to have supplied Panhard light armoured reconnaissance vehicles. An order for 150 UNIMOG trucks was placed in Germany and the Swedish company Bofors was alleged to have supplied howitzers at an unspecified date. 17These sales were recorded within a context of keen competition involving other suppliers like Brazil, who supplied 75 EE9 type Cascavel light armoured vehicles in 1994. In 1991, according to SIPRL, 2739 Albatross training aircraft were supplied by the then Czechoslovakia for 100 million dollars. In the early 1980s, Switzerland also supplied Piranha armoured personnel carriers and received an order for seven turbo PC7 training equipment. Finally, the United States also supplied sixty Air Beetle type practice equipment, which like other aircraft within the same category, are perfectly appropriate for anti-guerilla engagements. 18The European Union, Nigeria’s primary trade partner, primary donor and primary creditor, is also the primary foreign investor in the country, according to the sometimes contradictory information that has been gathered with some difficulty. In its October 1994 newsletter, the French Poste d’Expansion Economique of Lagos laconically indicated that ‘no statistical instrument to identify the origin of invested capitals exists’ (sic). Nevertheless, in June 1992, according to the same source, French investments represented 20 per cent of the foreign stock, just after the United States, with 3.9 billion dollars. Some time after that, however, other information from the same Poste dExpansion Economique of Lagos, ranked British investors first with about 38 per cent of stock, ahead of Americans who held 29 per cent, leaving other European operators with 17.5 per cent. 19There is no doubt that oil and gas exploitation account for considerable investments (Shell, Mobil, Chevron, Agip, Elf, Texaco). On 15 December 1995, just after the execution of the Ogoni leaders, the agreement on the 3.6 billion dollar liquefied natural gas project was concluded (but only 2 billion dollars for the financing of the first trench was approved) for the exploitation of a potentially viable resource (2.4 trillion cubic metres), the equivalent of the United States gas reserves. The Nigeria Liquefied Natural Gas Ltd (NLNG) was created to manage the project with a share profile as follows: NNPC, 40 per cent, Shell 25.6 per cent, Elf 15 per cent and Agip 10.4 per cent. The project holds a good position in the EU’s supply strategy, as was hinted by the director for the strategy and development of Elf Aquitaine, Francis Girault, at the beginning of last year at a conference organized by the Brussels Club to address the challenge of constructing a Euro-Mediterranean economic space. Mr. Girault expects a fall in the net flow of hydrocarbon supplies from the South and East Mediterranean countries in the next 25 years because of the anticipated increasing consumption in southern Europe and in the supplying countries. This is why, Francis Girault predicts that Europeans will fill this gap by increasing their supplies of natural gas from suppliers such as Norway, Russia and Nigeria which, he recalled, ‘is endowed with a liquefying industry to satisfy European demand’ (sic). 20This major investment will generate contracts for a consortium comprising the French engineering company, Technip; the Italian company, Snam Progetti; the American company, Kellog; and the Japan Gasoline Corporation. Production will represent a total of 7 billion m3/year destined, respectively, for the Italian electricity firm – ENEL, Enagas (Spain), Gaz de France and the Turkish company, Botas. 21Elf asserted its leading role in the market after it bought back 5 per cent of Shell-NNPC shares for 550 million dollars in 1994. According to its development plan, the French company was, in addition, to begin a two-year drilling campaign in the Nigerian offshore in mid 1997. Another enormous investment linked to the oil sector is the contract won by the French Company, Bouygues Offshore for the construction of the Forcados maritime terminal (180 million dollars). Bouygues, in partnership with another company, also signed an agreement with the American oil company, Mobil, for the supply of equipment for the exploration of the Usari marine field. It is to be noted also that the Franco-Norwegian company Coflexip Stena Offshore rented out one of its ships to the Brazilian oil company Petrobras to lay a flowlines network. 22The Italian company Agip also started a one-year drilling campaign in mid 1996, while British Petroleum whose assets were nationalized in 1979 by the Nigerian government as a reprisal for BP’s participation in a swap agreement which resulted in oil supply to South Africa, recently made a discreet return to the Nigerian scene. BP is actually associated with the Norwegian company, Statoil, which drilled the Oyo-1 offshore wells in 1995, on the OPL 210 block and has two exploration licences for the zone. 23Even though it has finally withdrawn from the liquefied gas industry project, the International Financial Corporation (IFC) which belongs to the World Bank group, remains active in Nigeria and indirectly contributes to the financing of related activities in the oil sector. Consequently, SFI as reported in the Expansion Africa Newsletter of 10 June 1996, agreed to a loan of $ 117,000 to the British company, Bailey Bridges, for the installation of a landing-stage to transport its lorries and staff. Bailey Bridges is actually a service company to the oil sector and is specialized in the supply, installation and exploration of prefabricated steel bridges for coastal oil fields. 24As important as the contributions of its rivals and associates are, Shell still remains undeniably the primary foreign investor in Nigeria. In 1995, the company invested a billion dollars in its exploration and production activities. In the same year, the Managing Director of Shell Nigeria, Mr Brian Anderson stated that the budget for that year could increase to 1.3 billion dollars. This budget is, however, 300 million dollars below the estimated amount, due to a reduction in the Nigerian government’s contribution; a situation deplored by foreign oil companies. The government’s objective in reducing its contribution was to increase the amount of its proven reserves (about 18 billion barrels representing about 25 years of production at the present pace). Gas reserves were estimated at about 3,400 billion m3, i.e., the equivalent of 100 years of current production in Algeria, which covers 20 per cent of all EU imports). 25Conversely, despite the volume and amount of foreign investments in the energy sector, Nigerian authorities are concerned that the pace of exploration is not commensurate with that of exploitation. According to the London-based newsletter, Inside Nigerian Oil, the number of wells that went into production, 53 and 70 in 1993 and 1994, respectively, exceeded that of exploration wells (30 and 51). 26Finally, in the energy sector, the British firm, Carbomin, opted for the future of Nigerian coal mines, whose estimated reserves are 190 million tons. It holds 40 per cent of the shares in the Eagle Mining Company, the equivalent of that of its partner, the Nigerian Coal Corporation. The remaining shares are held by the public. 27European investments cover numerous activities in other sectors, which is in line with the Nigerian economic fabric, undeniably the most diversified in the south of the Sahara, with the exception of South Africa. 28In the manufacturing industry, the sectors in which foreigners are most active are, in descending order: food with Cadbury, Lever Brothers, Tate & Lyle (United Kingdom) and SCOA Trading (France); textile and breweries with Guinness (United Kingdom); furniture and chemicals with French Brossette and COGEMAT; rubber with (Michelin, Dunlop); plastics, printing and automobiles with (Peugeot, Leyland, FIAT, Mercedes, Volkswagen). 29Also participating are various BTP firms and capital goods producers including the French companies, Fougerolle and Dumez, who, along with the German firm, Julius Berger, participated in the construction of the Ajaokuta iron and steel complex. The German company, Siemens was associated with the Delta gas-fired plant expansion project. Industrial engineering is an area where there is a noticeable European presence. The French company, Technip, and the Italian companies Tecnimont and Spie Batignolles, together with some Japanese companies were able to win a billion dollar contract for the construction of the Eleme petrochemical complex in Rivers State. 30The list above is not exhaustive, but it can be noticed that in recent years, the leading position of British investors is being gradually eroded by the Americans, who are much more active in the oil sector. According to the latest available statistics, since 1992, American capital inflow represented most of the foreign capital, with a total of 9.6 billion naira, far above the flow from the United Kingdom (N638 million), France (N558 million), Germany (N198 million) and Italy (N15 million). The net flow also shows the predominant share of American capital (N6.8 billion) compared to that of the European countries: the net capital flow from the United Kingdom rose that year to 560 million naira, a figure hardly higher than that of the French (N558 million). A disinvestment by the Italians was noted: in 1992, their capital repatriation exceeded their investments in Nigeria by 295 million naira. Although the Asians (with the exception of Japan) became keen competitors at the trade level, investment flow from this region of the world was still negligible at the time (N177 million naira only). 31In the absence of other information, the turnover of European subsidiary firms in Nigeria provides a rare indication of their impact on the country’s economy. 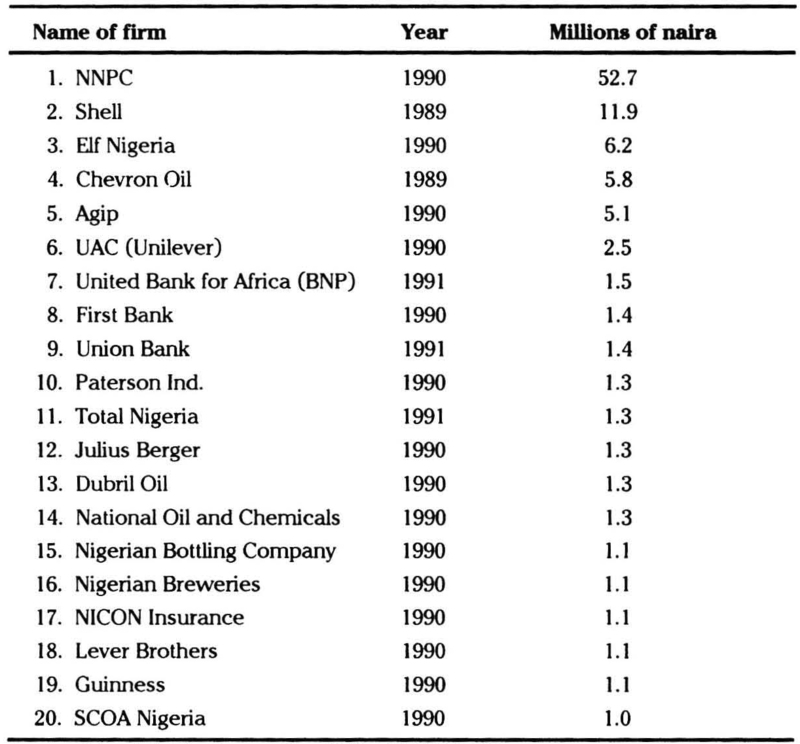 At the beginning of the decade, among the first twenty companies operating in Nigeria, ten were European (table 1). 32Nevertheless, the situation has drastically changed since then. Apart from the energy sector, an important disinvestment estimated at 10 billion naira has been observed since 1993. In the pharmaceutical sector alone, the withdrawal of 14 European companies (including British Glaxo and Wellcome) resulted in decapitalization of 3.5 billion naira. The disinvestment of Unilever from UAC Nigeria PLC companies and of Vono Products PLC represented a loss of 2 billion naira for the national economy. At the same time, the banking sector suffered, especially due to the withdrawal of Standard Chartered Bank (United Kingdom) from First Bank as well as that of the BIAO which was the major shareholder of Afribank. If similar measures taken by Barclays Bank and American Express were to be included, the total disinvestment in the banking sector stands at 2 billion naira. This illustrates the wariness of the European oil investors in a situation where political power remains in the hands of the military. Numerous other European financial institutions are, however, still operating in Nigeria, particularly: Belgolaise (of the Belgian General Bank group) through its subsidiary Nigbel; the Société Generate (France); BNP through United Bank for Africa; and Commercial Bank, a subsidiary of Credit Lyonnais. 34Finally, it should be noted (see the section on debt) that the programme for the conversion of Nigeria’s debt into investments, which started in 1988, is compensating for the loss engendered by the withdrawal of a number of European companies, even if this measure has not resulted in any significant new external capital contributions to the Nigerian economy. In other words, in a depressed economy, European investments are, however, likely to remain significant in the coming years. 35Before the annulment of the June 1993 elections by the military government, the European Union (EU) stood out as the second donor after the World Bank. Since 1975, the EU has allocated one billion ECU to Nigeria; 650 million as grants and the rest as soft loans from the European Investment Bank (EIB). This amount placed Nigeria second on the list of the EU’s ACP beneficiaries after Ethiopia, which received two billion ECU during the same period through grants given from selected national programmes concluded within the context of the four conventions of Lome, including emergency aid, food aid and EIB loans. 36Nigeria, due to its population, which makes it the most populous ACP state, as well as its low GNP per inhabitant (310 dollars) and its inclusion by the World Bank amongst the low income countries, was allocated 365 million ECU under the Lome IV national programme for the 1990-1995 period and was the first beneficiary of the convention. This also indicates just how much times have changed since the signing of the first Lome Convention in 1975. Claude Cheysson, one of the founding fathers of the Lome Convention, during a discussion with the author of this paper, remembered how Nigeria, at that time, carried away by the euphoria of the petroleum boom, had asked to be allowed to contribute to the European Development Fund through a special fund constituted from oil revenues. This would be ridiculous today. 37Despite the efforts made by the Europe fifteen members, it must be admitted that European aid does not have the same impact in Nigeria as in other potentially smaller, poorer countries or among those struck by natural or man-made disasters. Indeed, the allocation made under the Lome IV Protocol corresponds to an annual average contribution to the tune of 0.3 per cent of the Nigerian GNP and 4 ECU per inhabitant for the five years considered. 38Comparatively, in Rwanda, in 1993, before the genocide of the following year and even excluding other aids, the National Indicative Programme (NIP) represented an annual average endowment equivalent to 2 per cent of the GNP and a grant of 5 ECU per inhabitant for the five-year period. It has been observed that, contrary to what is observed in other ACP countries, even if other aid is taken into consideration, such as the structural adjustment facility or European Investment Bank loans, aid to development from the EU is by far exceeded by the flow of private capital. This could explain why a freeze on European aid has not had the same impact on Nigerian leaders as elsewhere. 39Thus, according to the convention between the Nigerian government and the Union, NIP funds from Lome IV were allocated to a range of projects of obvious interest to the people and for the protection of the environment. These funds were primarily meant for the development of human resources and institutions, for example, the Sokoto Environmental Programme and the Katsina Arid Zone Programme, in line with the development of agriculture and the supply of potable water. In some regions, European aid assumed much importance. Thus, beneficiaries of a development project on tea cultivation on the Mambilla Plateau, were offered the equivalent of about $300 per person, per year, while beneficiaries of a development programme on the cultivation of oil palm trees were offered about $275 per person per year; not in cash but in infrastructure and facilities. 40Moreover, Nigeria also benefits from European funds granted under regional aid for the eradication of cattle pests, the struggle against coastal erosion, the development of research on agriculture and the production of an aeronautics telecommunications programme by satellite. Nigeria also benefited from EIB credit facilities to develop small and mediumscale enterprises from 1980, until the drying up of EIB loans in 1993 due to the failure to pay arrears as well as the indefinite suspension of democracy in the country. 41In view of the number of administrative and technical bottlenecks, however, bilateral co-operation experienced gradual setbacks. Consequently, programmes were reviewed and from October 1994 the struggle against poverty was defined as the priority of future programmes. 42It should be noted that thanks to her industrial and economic fabric (compared with other ACP states), Nigeria also benefited, several times, from contracts generated by the European Development Fund, not only within the country, but also elsewhere. That is how, in 1991 for example, the National Fertilizer Company of Nigeria (NIFCON) won a bid valued at 6.3 million ECU to supply fertilizer to Malawi. 43Having outlined the economic relations between the EU and Nigeria, it is pertinent to know whether the various sanctions decided upon by the EU during its council meetings in late 1995 and 1996 had any influence on the attitude of the Nigerian Government, or at least on the activities of European interests in Nigeria. 44In order to give an answer to this question, it is necessary to note that European sanctions have not affected the energy sector whose capacity is to be reinforced by the construction of a liquefied gas plant. The option of an oil embargo was, however, discussed by the foreign affairs ministers of the Europe Fifteen on November 20, 1995 at Brussels. On this occasion, the Swedish and German delegations appeared to be the most determined to act in this regard. The other delegations, however, did observe unofficially that Sweden could afford to stand out as a defender of human rights in a country where it has very limited interests. The opinion of the Belgian foreign affairs Minister, Erik Derycke, stated on December 13, 1996 in Parliament at Brussels, to the effect that a ‘real’ embargo decreed by the United Nations would be better than a unilateral one from the EU, is one shared by most of his colleagues. In addition to the argument on effectiveness of sanctions, European diplomats often refer to the legal problems that would be inherent in such a unilateral embargo, given that only an embargo decided by the United Nations Security Council would be acceptable to the World Trade Organization. Many diplomats from EU member states believe that the support of the United States is indispensable for such an embargo. Even in this case, a security council vote would be difficult to obtain due to a possible Chinese veto. The Chinese could act under the diplomatic doctrine of non-interference, and in consideration of a recent bilateral co-operation agreement between China and Nigeria. 45The Belgium minister disagreed with the suggestion by the ecologist, Senator Laurence Dardenne, that conditional clauses on the respect for human rights in Nigeria, be included in the contract concluded by Distrigaz Company with Shell the Belgian Company (in which Shell has 16 per cent shares), or that the company could encounter ‘difficulties in its contacts with Shell’. 46It is obvious that the implementation of such measures would not be easy. A European diplomat said in July that all that could be done from a legal perspective had already been done by the Europe Fifteen. Nevertheless, during the Council of July 15, held in the wake of an American move aimed at increasing pressure on the Nigerian government, concerning ‘a number of potentially positive developments’ including ‘the release of a number of political prisoners and the establishment of a Human Rights Commission’, the Europe Fifteen indicated its intention to ‘pursue the definition and examination of new measures, in consultation with other interested countries and organs’ (sic). Actually, the Council stated simultaneously, that it was’ seriously concerned by the general situation of human rights as well as by the pace and manner of the transition towards a democratic regime, including some aspects of the guidelines on the formation and registration of political parties recently published by the Electoral Commission of Nigeria’. The absence of a precise commitment concerning an electoral timetable was one of the elements which prompted the Europe Fifteen to wield this threat of additional sanctions. 47Most of the diplomatic sources interrogated did not, for ‘obvious reason’ (sic), wish to specify what measures could be adopted. However, a source revealed that in July 1996, the measures under consideration included a ban on private loans to the leaders, a formula directly concerning the oil sector, as well as a freeze on the assets of the leaders. These measures are supposed to have been discussed among European and American diplomats on the one hand, and representatives of oil companies including Shell on the other. The measures would, however, allow these companies to continue their activities in Nigeria. The formula was to have the advantage of not contravening freedom of trade, or acting against the interest of oil companies. It would allow the pursuit of supplies while putting a financial noose on the Abuja Government, which is the main objective. Under this scenario, as discussed by researchers during a recent seminar organized by a British University, companies would no longer pay royalties and other taxes owed the Petroleum Special Trust Fund, as managed by the Nigerian Presidency (whose value represents the equivalent of 40 % of the national budget), and which avoids all control, like the other NNPC accounts. This money would go to a special account to which only Western donors would be signatories and from which annuities would be deducted to reimburse debt arrears, as well as provide for expenditure linked to the pursuit of the country’s petroleum activities and the salary of workers in the industry. 48On the suggestion that the Nigerian government would rather stop all supplies than accept a formula encroaching upon its sovereignty, a European expert told us that in such circumstances, it would be General Sani Abacha, and not Brussels or Washington, that would have initiated such a serious and financially suicidal move for Nigeria. 49In addition to the legal implications (which still have to be studied), of such a ‘private embargo’ by all the parties, we can, within the context of American policy on sanctions against two oil producing states, i.e., Iran and Libya, consider if such a formula would be welcome today. Indeed, as the European Commissioner for Energy, Christos Papoutsis, pointed out the day after President Bill Clinton signed the Amato Law providing for sanctions against business from countries supplying equipment to the oil sector of the two countries mentioned above, this provision will sooner or later affect the production capacity of these countries who expect up to 20 per cent of external supplies from EU countries. 50Predictably, the EU indicated its strong opposition to such a law due to its extra-territorial nature. However, the effects of the American decision to apply the Amato Law cannot be underestimated. Moreover, the effect of such a law will be felt in time. This action should be taken into consideration in the debate on an oil embargo on Nigeria. Such a context actually appears more unfavourable to the application of immediate sanctions against a member-country of OPEC, either by Washington or the Europe Fifteen. The pressure which the Americans want to put on Europeans in order to make them accept the consequences of the Amato law, would be more difficult to apply in a context where Washington would try to induce the latter to deprive themselves of a substantial source of their external supply. One can also ask if barring the clearly expressed wish of oil companies to increase the free-flow and the price of ‘the black gold’, the United States, which imports much more oil from Nigeria, will risk paying the highest bill for causing an embargo on Nigeria. 51Amongst the other sanctions mentioned by the Europe Fifteen last July, was the suspension of the benefits of the generalized preferential systems (GPS) under trade. The idea was dropped immediately because the symbolic nature of such measures would have absolutely no effect and could actually be counter productive, eroding the credibility of the union, since Nigeria would continue to benefit from access to the European market, which is better than the GPS, under the provisions included in the Lomé Convention. At this stage, the direct exclusion of Nigeria from the Lomé Convention has not yet been considered, since this act would face enormous legal and diplomatic obstacles. Such a sanction was suggested on two occasions in recent years at the European Parliament against Haiti, after the coup in the country, and against Sudan, in view of the multiple violations of human rights and massacres committed by the regime in that country. Nevertheless, this measure was also abandoned because it would have required the agreement of all the states that are signatory to both the European and ACP conventions. It would be difficult for Nigeria’s immediate neighbours to expose themselves to all kinds of reprisals, without serious guarantees of protection. The recent appointment of Nigeria to head ECOWAS is ample proof of the direction of geo-political gravitation in the region. 52Beyond speculations as to what future measures could be considered, the consequences of European sanctions adopted on November 20, 1995, was the deprogramming of about 86 million ECU committed to the ongoing programmes and the freezing of 220 million ECU from the Lomé IV envelope. Concretely, this decision was especially translated through the closure of a support programme to the libraries of 38 universities which will lose a contribution of 134,000 books as well as subscriptions to 450 publications. The suspension of the co-operation project with the parastatal, Nigerian Telecommunications (NITEL) will cause the loss of a training programme for some 3,500 directors, engineers and technicians of this firm. The measure will also impact negatively on the services provided in the area of telecommunications all over the country. 53Consequently, the European Commission is aware that up till now, the suspension of aid has had a relatively limited impact at the political level, especially as the measure has never been reported in the media. It was felt mainly at the National Planning Commission and would probably also be perceived within the ten states of the Federation, where the European Union had supported development much earlier. 54The limited impact of European sanctions can also be as a result of some factors which have contributed to making them ineffective. Obviously, in line with the decision of the November 20, 1995 Council of Ministers, no new project has been submitted to the European Development Fund (EDF), which comprises representatives of EU member states and which also gives a final ruling on the issue. There are some exceptions to the rule, however, namely: human rights support programmes and democracy groups as well as Nigerian-based NGOs working to alleviate poverty. 55This is the case with the aeronautics telecommunications project by satellite for West and Central Africa. Moreover, the Commission accepts that suspending these ongoing projects at the time the decision was taken by the Council of Ministers involved technical, financial and legal difficulties. A ‘premature’ termination of these programmes could endanger existing investments made under the EDF in the area of infrastructure, equipment or human resources, as shown in an internal note on the General Directorate for Development. In addition, as the same source says, the interruption of technical assistance or work contracts could lead to complex and expensive law suits from those likely to seek compensation. For all these reasons, the Commission is of the view that activities concerning ongoing programmes will be ‘exceptionally possible’ under some conditions, i.e., where it serves to suspend projects in an orderly manner; if they contribute to safeguarding existing investments (new maintenance contracts, supply of essential equipment or technical assistance); if they permit auditing; and if financial controls can be continued satisfactorily. 56Another factor militating against the effectiveness of the sanctions hitherto adopted is that the European embargo on arms supply to Nigeria, decided on November 20, 1995 does not mean an ipso facto cessation of all supplies. A footnote on the page of the Council’s official document actually stipulates that the embargo on arms, ammunition, spare parts, maintenance of military equipment and the transfer of technology does not affect contracts concluded before the date of this common position. In other words, even if each export licence is subject to a case by case examination by EU member states, as the Belgian Foreign Affairs Minister pointed out in December 1995, and that these exports are presumed to be rejected, it is possible that some deliveries could have been made even after November 20. Indeed in November 1994, the World Development Movement in London recalled that the decision taken by EU member States after the annulment of the 1993 elections by the military, to adopt a position rejecting new licences was not unanimous, especially with regard to the supply of military equipment meant for the Nigerian contingent in ECOMOG in Liberia, which officially is involved in a peace-keeping operation supported by the United Nations Security Council. The question, therefore, is whether such equipment was able to be transferred to military units in Nigeria or was repatriated to Liberia by a unit which had completed its mission in this country. 57In sum, hitherto, the Europe Fifteen like their American partners have not yet adopted measures affecting the lifeline of the Nigerian economy, i.e., the energy sector. The only wide ranging measure which can affect oil production in the next few months was the decision by the NNPC to reduce by 30 per cent in 1996, the budget of its joint ventures, to the detriment of foreign companies who were expecting to increase the expenditure on oil exploration and trade. This explains the choice made by the government to pay up its arrears to oil companies and to give preference, at the cost of a reduction of its investments in the development of the production capacity, to the retention of its control on these same joint ventures instead of financing an expansion of this financial capacity funded by the release of a part of its oil shares. 58This prospect which threatens to reduce eventually the global solvency of the economy, combined with the shrinking of export markets observed over the past years and the freezing of its western financing, makes this country less attractive than what it was in the previous decade despite its potentials, except in the oil sector, thus leading to a general wait-and-see attitude which is sometimes expressed by strategic withdrawal. 59Consequently, the nature of the increasing decline tends to reinforce the negotiating power of Western donors with regard to opening up Nigeria’s political space, despite the absence of sanctions against oil sales. However, this process may not have an impact in the short term, especially since the sanctions in force are applied with caution and are aimed at protecting the future of the European presence in Nigeria, and could be misconstrued as an absence of firmness on their part by the present leaders of Nigeria. MISSER, François. 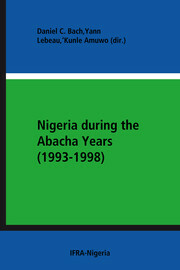 European Interests in Nigeria In : Nigeria during the Abacha Years (1993-1998) : The Domestic and International Politics of Democratization [en ligne]. Ibadan : IFRA-Nigeria, 2001 (généré le 21 avril 2019). Disponible sur Internet : <http://books.openedition.org/ifra/645>. ISBN : 9791092312089. DOI : 10.4000/books.ifra.645. Misser, François. “European Interests in Nigeria”. Amuwo, ‘Kunle, et al.. Nigeria during the Abacha Years (1993-1998) : The Domestic and International Politics of Democratization. Ibadan : IFRA-Nigeria, 2001. (pp. 235-257) Web. <http://books.openedition.org/ifra/645>.